I haven't played at either one of these challenges for awhile, but they fit together beautifully for me today. 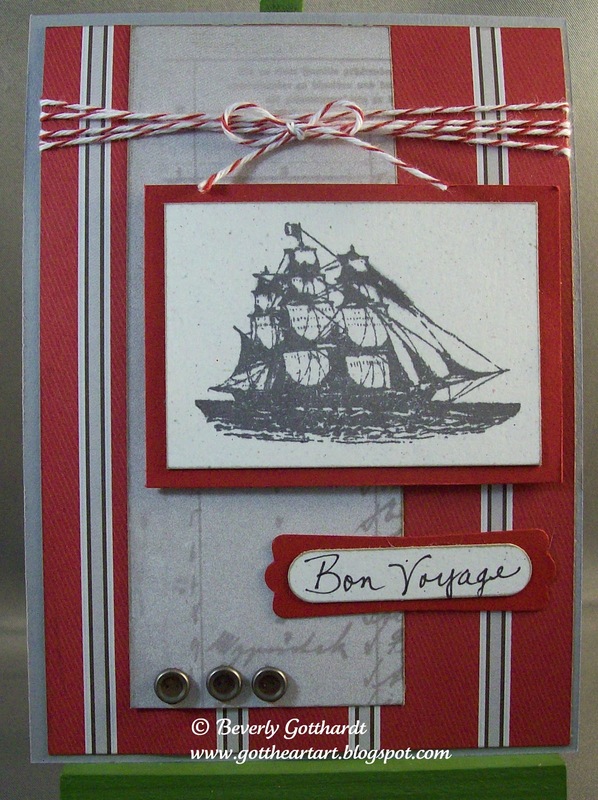 Supplies: 4" X 5 1/2" card blank, Papers: SU-Basic Gray, Naturals White, Designer Series Paper Nautical Expedition, Stamps: SU-The Open Sea, Ink: SU-Basic Gray, Sahara Sand, SU punches-Word Window, Modern Label, SU-Bakers Twine-Cherry Cobbler, The Paper Studio Spare Parts-button brads, SU dimensionals. Very handsome card. Love the color palette with the ship and baker's twine. Perfect travel card! Love how you tied it all together with the twine! Lovely card! Great use of the twine! What a beautiful masculine card. Thanks for playing this week! You make creating masculine cards look easy! This is fabulous! I wish i could come up with such a wonderful masculine card! Thanks for playing this weeks Stampin' Royalty Challenge! Great card, love the layout and colors you used. Thanks for joining us at blogger's challenge. Very striking, love your colors! Thanks for playing along with the Bloggers Challenge!